China's Joint Staff Department Deputy Chief Admiral Sun Jianguo speaks at the IISS Shangri-La Dialogue in Singapore, June 5, 2016. A senior Chinese military official on Sunday rejected the U.S. defense secretary’s assertion made the previous day that Beijing faces “erecting a Great Wall of self-isolation” if its continues with provocative militarization of disputed islets in the South China Sea. "Clearly (U.S. Defense Secretary) Ash Carter's warning against China building a Great Wall of self-isolation struck a nerve,” said Professor Rory Medcalf, head of the National Security College at Australian National University, who was in the room for the admiral’s remarks. "Admiral Sun insisted China was not isolated,” Medcalf told VOA. “Yet there was plenty of evidence to the contrary in the anxious questions about China's security behavior from others in the room, of many nationalities." Sun, the deputy chief of the joint staff department, sought to shift blame onto the United States for maritime tensions in the region. He criticized the U.S. military’s freedom of navigation operations and Washington’s support for countries in the region having territorial disputes with Beijing. U.S. Defense Secretary Ash Carter, center, meets with Japan's Defense Minister Gen Nakatani, left, and South Korea's Defense Minister Han Min Koo during their trilateral meeting on the sidelines of the 15th International Institute for Strategic Studies Shangri-la Dialogue, or IISS, Asia Security Summit, in Singapore, June 4, 2016. "The admiral's strident tone was intended partly for a domestic audience” as part of his speech was broadcast live on national television in China, Medcalf said. Carter, at the same forum in Singapore on Saturday, told defense ministers, security analysts and scholars there is “growing anxiety” about Chinese actions in the strategic waters and elsewhere. U.S. Secretary of State John Kerry, speaking to reporters in Mongolia on Sunday, said Washington would consider any Chinese establishment of an air defense zone over the South China Sea to be a "provocative and destabilizing act." Some Southeast Asian nations are feeling caught between Washington and Beijing and expressing concern. “Whatever both countries do it must be balanced or it causes trouble,” Thailand’s deputy defense minister General Udomdej Sitabutr told VOA. “Even with balance there are still problems but it will not escalate,” added Udomdej, the former chief of Thailand’s army, which dominates the current military junta government. Beijing claims virtually all of the sea, through which $5 trillion of trade passes every year. 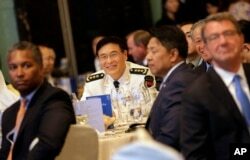 China's Joint Staff Department Deputy Chief Adm. Sun Jianguo, center, attends the Opening Dinner of the 15th International Institute for Strategic Studies Shangri-la Dialogue, or IISS, Asia Security Summit, in Singapore, June 3, 2016. U.S. Defense Secretary Ash Carter is at right. Much to the concern of others in the region and the United States – fearing impediments on freedom of navigation – China has recently constructed airstrips and placed military equipment on artificial islands built on previously submerged reefs. During the annual Shangri-La Dialogue and Asia Security Summit here Chinese officials repeated Beijing’s long-held stance that such disputes should be settled through country-to-country discussions, not by multilateral engagement or international mediation. In the case of its dispute with the Philippines, the Chinese are encouraged by recent comments made by President-elect Rodrigo Duterte, who has said he is open to bilateral discussions. “We hope the new Filipino administration can shake off the burden” of the outgoing one, Sun said, in response to a question from the floor. Philippines President Benigno Aquino, contending Manila exhausted attempts to settle the matter directly with China, went to an international tribunal based at The Hague seeking a decision that any claims in the South China Sea must conform to the United Nations Convention on the Law of the Seas (UNCLOS). A ruling is expected soon that, at least in part, will favor the Philippines, invalidating China’s nine-dash line, which outlines the water and islands Beijing claims. Admiral Sun and other Chinese officials at the Singapore meetings made it clear any decision at The Hague will not change Beijing’s stance. “China will not recognize nor honor any award” made by an international tribunal regarding the dispute with Manila, he said. Besides the Philippines, China is also facing conflicting maritime territorial claims with Brunei, Indonesia, Taiwan and Vietnam. The Vietnamese, most notably, have put aside the legacy of war with the United States to draw closer to the Americans in face of perceived increasing threats from Hanoi’s giant neighbor to the north – a fellow communist state but also a repeated adversary over the past millennium. From the rhetoric publicly expressed here during the past two days it is difficult for Beijing not to have the perception that a number of countries are drawing closer to the United States, at the expense of China, when it comes to how to settle the maritime disputes. India – another traditional adversary of China – and Japan – which has a territorial dispute with Beijing in the East China Sea – are among those expressing fresh concern about China’s activities while announcing new agreements with Washington in the defense arena. 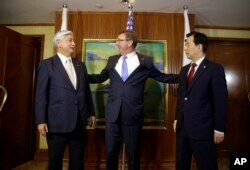 Besides Japan, the United States also has mutual defense pacts with the Philippines and South Korea. There is also a U.S. defense partnership with Singapore. Analysts attending the dialogue noted voices from beyond the region expressing concern about China’s activities. "It was striking that even distant countries like France, the U.K. and Canada had ministers present to advocate a rules-based order and respect for freedom of navigation and small countries," Medcalf said. Li Ya in Singapore of VOA’s Mandarin Service and State Department correspondent Nike Ching in Ulaanbaatar, Mongolia, contributed to this report.